The APC spokesman, Yekini Nabena in a statement on Tuesday described Saraki "A Rolling Stone That Gathers No Moss" and asked him to vacate the senate presidency honourably. "He should be a distinguished Senator in name and in deed. He cannot continue to preside over the APC-dominated Senate as a member of the minority PDP", Nabena said. The disappointing performance of Sen. Bukola Saraki at the Presidential Election Convention of the Peoples Democratic Party (PDP) is a befitting end to the ambition of a greedy, untrustworthy and double-dealing politician. With a miserly 317 votes, behind Aminu Tambuwal's 693 votes and Atiku Abubakar's 1532 votes, the PDP delegates have given clear indication that they are fed up with Saraki's political style. When a leader cannot be trusted, cannot be relied upon, and cannot keep agreements, the people take due cognizance and records of these actions and respond with their votes at the appropriate time. 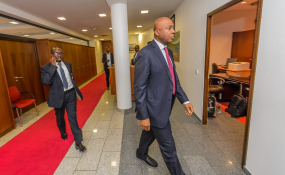 Throughout Saraki's tenure as Senate President, it has been one confrontation between the National Assembly leadership with the Executive or another. Confirmation of Executive nominees sent to the Senate for confirmation has been delayed unnecessarily, annual national budgets delayed. For instance, the supplementary budget of the Independent National Electoral Commission (INEC) for the 2019 General Elections is continually delayed due to Saraki's selfish political machinations. A selfish Saraki will rather than perform his constitutional legislative functions by ensuring timely consideration and passage of Executive bills, sabotage the efforts of the Executive in furtherance of his treacherous politics. Having sabotaged the President Muhammadu Buhari government while in the APC, he later showed his true colours by formally joining the opposition PDP. The APC bade him goodbye as he returned to the looters club where he belongs. However, in doing so, Saraki must do the needful by giving up the Senate President position. He should be a distinguished Senator in name and in deed. He cannot continue to preside over the APC-dominated Senate as a member of the minority PDP.